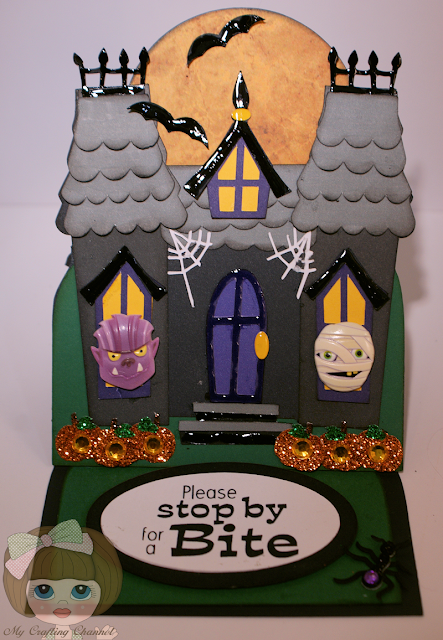 I made this adorable Halloween Easel Card. This is absolutely fabulous Nana!!!! This is super duper! Great detail, love the werewolf and the mummy! Super cute! I love this card. Have a great day!!! This is so cute Nana!! love the little heads poking out the windows and the sentiment is perfect!! This is SO FABULOUS!! Wow, Nana...very inspiring to! I love the mummy and werewolf is so spooky! Amazing! I love all the details! Great Halloween card! WOW!! This is just Beautiful! Fabulous !Spooky Cute!! Awesome job my friend. Just got a call from HALLMARK...they want your number , they are super jealous!!!! This card has everything you could want in a Halloween design. Love the glossy accents and sentiment. Have a fab Halloween...don't EAT the candy!!! Fabulous card! Love the way everything looks so polished and finished! Great colouring on the roof and the moon.